Celebrating this season of color I am offering the red glass Amphora rooting vase at a special price. 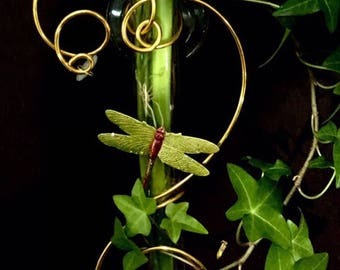 Measuring approximately 7 inches tall this bud vase is decorated with a hand colored stamped brass dragonfly, lightly dusted with a hint of sparkle. 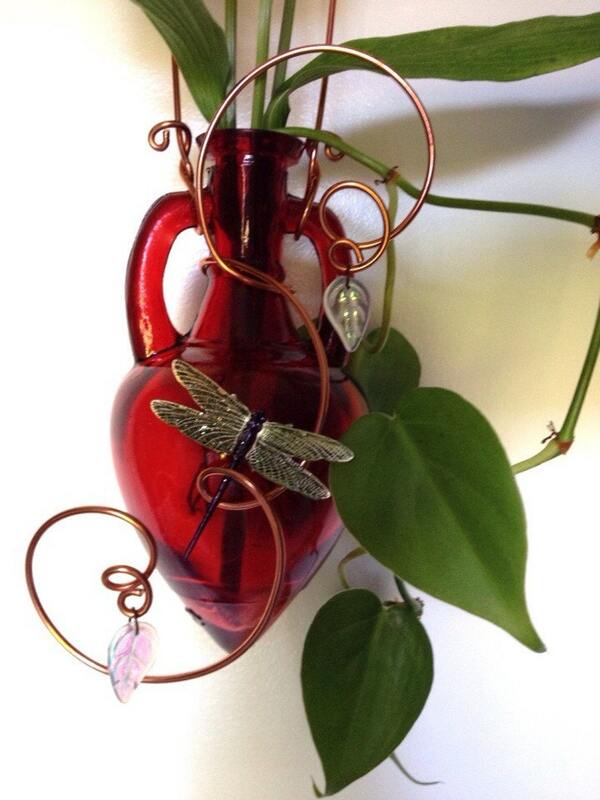 I wrap and sculpt the vase with copper colored, anodized aluminum wire that will not darken or discolor. Choose your wire color from the drop down menu. Hang this delicate, window vase from a 16 inch wire that wraps through the handles of the Amphora. This window vase can be used as a rooter vase, a bud vase, or you can place fragrant oils into the vase with some defusing sticks and it becomes a lovely room freshener. Add some fresh flowers to this hanging bud vase and you can brighten up any day through the fall and winter. https://www.etsy.com/your/shops/VasePlace/sections/5795198 to see more hanging Amphora Glass Vases at VasePlace. Gift wrapping of your Window Vase will include dried/silk flowers for a complete and beautiful presentation. Not recomended to present a "naked" vase. The Butterfly vase was so delicate and beautiful! Very Happy!! These vases are absolutely beautiful and I have no doubt I’ll be ordering more soon! Great quality and an absolutely beautiful item! Love love love!! I accept payment through the secure Etsy Direct Checkout process. I also accept Etsy Gift Cards. PLEASE NOTE: I do not personally receive any credit card info. All credit card transactions are processed by and through Etsy. NY, PA, OH as well as other state residents will be charged state sales taxes as deemed by state laws. VasePlace takes great pride in providing outstanding customer service. Contact me with your concerns and I will work with you to make it right. If an item is returned the buyer will pay return postage. Custom orders do not qualify for exchange or return. Many times the package will go out the same day the order is placed. I take pride in my customer service and super-fast shipping. ***Shipping will be to the address as stated on the order. If you provide the wrong shipping address I can not be responsible. Please double check that the shipping address is correct. If I have any question regarding the address I will attempt to contact you for clarification through an Etsy Conversation. If I do not receive a prompt reply, I will ship to the address as given on the order. Any errors will be the customer’s responsibility. Shipping is by USPS First Class Mail for weight less than 15 oz. Weight over 15 oz will ship USPS Priority Mail. Customer will receive Email with tracking and estimated time of delivery. Delivery times are estimated and not guaranteed. Special orders generally ship within 1-7 days depending on request. **INTERNATIONAL ORDERS** PLEASE NOTE: INTERNATIONAL ORDERS ARE ACCEPTED BY REQUEST. PLEASE CONTACT ME TO SEE IF I SHIP TO YOUR COUNTRY. All taxes, duty AND custom fees are the responsibility of the customer. Be aware of the taxes and duty and custom fees of your country. I will not be responsible for these fees. I CAN NOT GUARANTEE DELIVERY BY A CERTAIN DATE. Please leave yourself adequate time to receive shipments especially during holiday seasons. Of course I accept! This is my heart’s delight! Let me know your specific needs. Glass tube size - 3 inch (7.5 cm) x 1/2 inch (1.2 cm) Finished design size varies from 3.5 in to 4.5 in long. Can hold a single stem such as a rose or 5 stems of an assortment of fresh flowers. Flower stems are very thin for the majority of species. The suction cup measures 7/8 inch (2.3cm) and is rated to hold 2 lbs (0.9kg) of weight! Glass tube - 6 inches (15cm) x 3/4 inch (2cm). Finished design approx 8-9 inches (20-25cm) long. Suction cup size 2 inch (5cm) rated to hold 5 lbs (2.5kg) of weight. All glass tubes and suction cups are made in the USA. Vases are made of glass so that they can be cleaned and returned to pristine condition. Plastic would become cloudy and stained after holding plant material. Clean inside glass tube with a small amount of course salt and warm sudsy water. The salt acts like an abrasive to clean off debris and will not scratch the glass. Outside design should be dusted with a soft paint brush. Any silver design pieces can be rubbed with dry baking soda to remove tarnish. Be sure to clean suction cup and glass surface before replacing vase to its display surface. All vases are delivered beautifully packaged and include a small bouquet of dried botanicals or silk flowers. Gift wrap can be requested and a gift card is then included with the hand written greeting of your choice. How long have I been creating my vases? 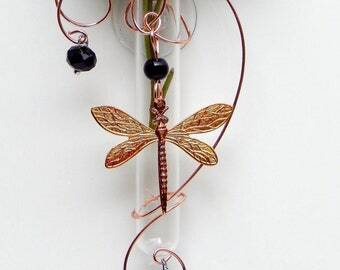 I began creating vases in 2000 and started with a simple dragonfly design. I was seeking relief from a stressful family illness. Nature has always been my source of peace and balance and flower gardening provides me connection to that natural energy of growth and strength and renewal. From decomposition to breathtaking beauty the garden flowers bring delight, and joy through color and delicate form. I wanted to created a functional, artistic means of enjoying that beauty and energy in the indoor environment. VasePlace was born with Mother Earth as my mid-wife. How do I get a suction cup to stick? Did you know that a slight film of Vaseline or oil onto the suction cup before applying will work much better than "licking and sticking"? Oil will stay moist while the moisture” will evaporate. How can I get my vase repaired? Where can I find you selling locally? Http://Www.facebook.com/vaseplacebydeb will have announcements of in person art and craft events.